Just a sidebar here in relation to Part 1. I said that Suzanne Mouton Riggio doesn’t have a blog and that is true but one of my readers, Trisha from Port Augusta, told me that there is someone else’s blog that gives more details about her work. Here is the link if you’re interested to learn more and thanks Trisha. Now, back to the exhibition. I had hoped to be able to show you pictures of a quilt called The Cross which has a cross very cleverly emerging from some storm at sea blocks but I haven’t had a reply to my request for permission so I’m afraid I can’t show you. However I do have two more beautiful quilts that I can show you and here they are. “In the beginning when God created the earth, the earth was a formless void and darkness covered the face of the deep … then God said let there be light.” According to Scripture, God went on to say let the waters under the sky be gathered together, let dry land appear, let the earth put forth vegetation, let birds fly, let the earth bring forth living creatures, and finally, let us create humankind in our image. And God saw that it was “very good.” Actually, it is way more than good. This is an astounding planet, full of astonishing creatures that are all intricately interdependent and ultimately reliant on clean soil, air, and water. To ensure the earth’s survival, we must make it our mission to be good stewards of creation and peacemakers among its people. And that, in the eyes of God, would be good. 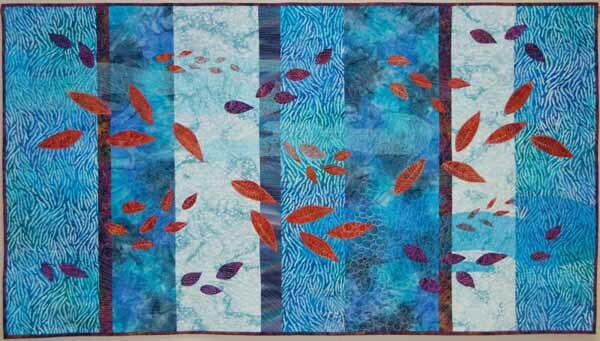 Kit has a blog which you can visit here if you’d like to see some more of her beautiful work. Believe me it really is worth a visit. Just as autumn winds blow leaves across open spaces and corral them into corners or crevices, so the winds of change move our souls along life’s path. On occasion we find ourselves alone, caught in a swirling eddy; other times circumstances bring us together with people for a short time or a specific purpose. Some are fortunate enough to have a lifelong friend who moves along with them, whether they are floating on the crest of good fortune or careening through precarious events. In whatever way we come into contact with others, we need to touch them with our kindness, because our paths may not cross again. This piece is dedicated to dear friends who have been swept away from this changeable world. Unfortunately Mary doesn’t have a website at the moment but I hope she’ll let me know when she does and then I’ll pass the link on to you. I hope you’ve enjoyed this taste of what was a wonderful exhibition. We spent several hours there just marvelling at the diversity and the creativity that was on display. What lovely works of love and art. Thanks so much for going to all the trouble to get permission to share them with us. 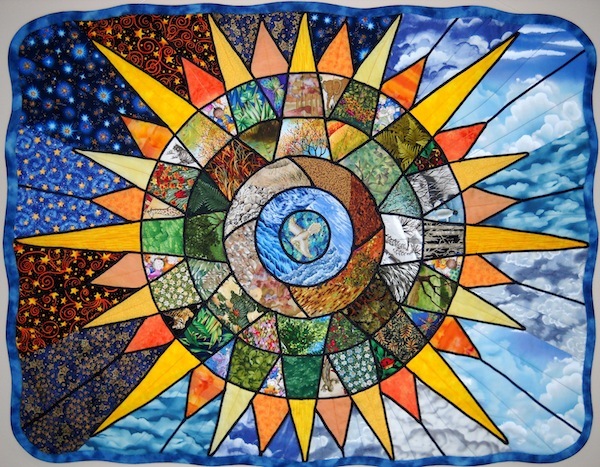 The people who make these quilts (and make is an inadequate word) have an otherworldly talent. Thanks so much for sharing these inspiring pieces. Thanks for sharing – truly beautiful ! Show must have been wonderful ! Love them all, but Mary’s work just seems to speak to me in it’s simplicity… Thanks for sharing that.